Kochi is a beautiful port city in Ernakulam district in the state of Kerala. It has several tourist spots and hence a large number of tourists visit this city. When you visit cities like Kochi while on vacation or a business tour, you must consider an accommodation other than a hotel stay. If you are planning to stay for longer, you need to make a choice carefully considering your budget as well as comfort, and here service apartments play a key role in fulfilling your wish. 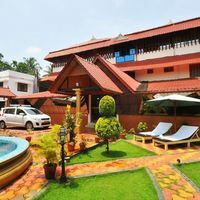 If you need the luxury of a hotel room with a home-like convenience, then service apartments in Kochi are an ideal accommodation choice for you. Serviced apartments are well-furnished apartments that offer you standard amenities you get in a hotel room. However, they can be considered better than those rooms as you can enjoy a more relaxed stay here. An online search on Cleartrip can help you to find excellent service apartments which are located near hilly regions, Ernakulam junction and several other popular localities. You can make a choice out of the many options available and enjoy a luxury stay along with great privacy and freedom. Serviced apartments provide you with everything you need in a home. They are equipped with nice beds, wardrobes, television, refrigerator, music system, internet facility etc. The dcor, furnishings and flooring, everything is as per the latest trends. Additionally, you are provided with a kitchen where you can cook the food of your choice as per your taste. The private kitchen has all the necessary appliances you would need while cooking. Some serviced apartments also provide a washing machine and dryer so can do your laundry on your own, without spending extra on it. If required, maid service and cook is also provided by the owners, on request. Well-appointed serviced apartments in Kochi are safe places to stay, with 24-hour CCTV coverage and security staff at the gate. You are also provided with the parking space if required. These properties provide you with complete privacy and nobody will disturb you unless there is an emergency. 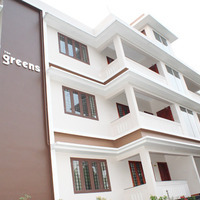 The comfort and luxury offered by these serviced apartments in Kochi is outstanding. The rooms are well-maintained and clean. Bathrooms have a 24 hour hot and cold-water supply and complimentary toiletries are provided. The size of the apartment is big usually 2-3 BHK, so one apartment can easily accommodate 2 families with kids. So, if you are travelling in a group, it is better to book one or two serviced apartments as per the need. At Cleartrip, we can help you in booking good serviced apartments and Kochi hotels in the city at your desired locations with the desired amenities. 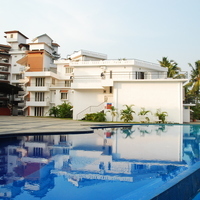 Kochi has many accommodation facilities such as hotels, guest houses, homestays and serviced apartments. All these are highly in demand as Kochi attracts a number of tourists, especially during the holiday season. 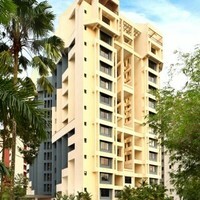 A large number of people prefer staying in the homely setting of an apartment instead of staying in a luxury hotel. 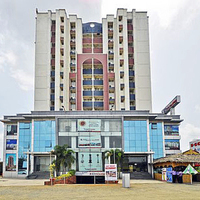 Cleartrip can assist you in finding the best serviced apartments in Kochi. A few popular options listed on our website are Summit suites , Sreeragam Luxury Villa Retreat , The Greens Residences , etc. If you planned a trip last minute and did not book a stay, you just need to search for serviced apartment near me and the list will be in front of you to choose from. The Cleartrip website is easy to navigate, and the booking procedure is very simple. 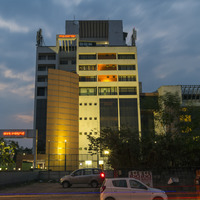 If you are planning to visit Kochi in the near future, book your stay online at the Cleartrip website or the mobile app. You will certainly get the best offers and handsome discounts on the booking. Advance booking with Cleartrip helps you to bag excellent deals!